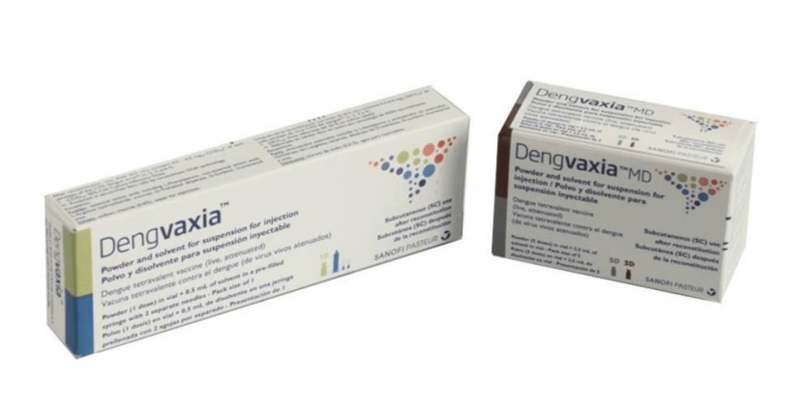 Dengvaxia (CYD-TDV) – the first licensed dengue vaccine – is a quadrivalent live attenuated chimeric dengue vaccine developed by Sanofi Pasteur. An attenuated yellow fever virus forms the backbone of the vaccine, with dengue structural proteins attached (the chimera). It has just been licensed in Singapore, and is approved for use in those between the ages 12 and 45 years. Three doses of the vaccine are recommended over the course of a year (0/6/12 months). It should become available in a few months’ time. The local cost of the vaccine is unknown, but is likely to be more expensive than the Philippines, where it is being retailed for SGD110-155 per dose. In the two multi-country licensing trials done in Asia and Latin America, Dengvaxia was found to be more effective against dengue serotypes (DEN-) 3 and 4 (71.6% and 76.9%), but less effective against DEN-1 (54.7%) and DEN-2 (43.0%). The vaccine appeared to be more effective in those who were seropositive for dengue (i.e. had prior dengue infection), and less effective in those below the age of 9 years. Its efficacy in those above 45 years of age, as well as in immunocompromised patients, is unknown (but one can reasonably expect it to be less effective especially in the latter group). It has a pooled vaccine efficacy of 79.1% against severe dengue. The duration of protection is unknown, but unlikely to be lifelong. It appears to be a very safe vaccine. There are another 5 dengue vaccines at various stages of development, but none are expected to reach the market within the next 3-4 years. Who should get the vaccine in Singapore? The predominant serotypes for the past decade has been DEN-2 and DEN-1, against which the Dengvaxia vaccine is far less effective. For the individual, there is a need to weigh the costs against the suboptimal (but far better than zero) protection offered by the vaccine against dengue. For the community, I agree with Prof Tikki Pang that widespread use of the vaccine will contribute to the general herd immunity of the population to dengue, but the vast majority of people do not make decisions on vaccination based on the public good. There are several thousand dengue cases each year (it is 11,874 cases this year as of last week), and even a reduction of 40% is marvellous. Holding out for a potentially better vaccine could take several years at least.